Nowhere in the world is weather as volatile and powerful as it is in North America. Scorching heat in the Southwest, hurricanes on the Atlantic coast, tornadoes in the Plains, blizzards in the mountains: Every area of the country has vastly different weather, and vastly different cultures as a result. 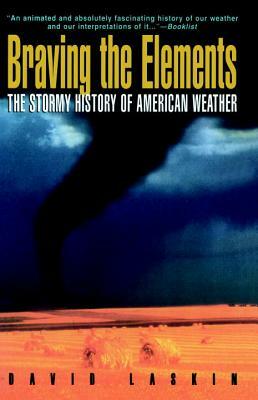 Braving the Elements is David Laskin's delightful and fascinating history of how our unique weather has shaped a nation, and how we've tried to cope with it over centuries. Since before Columbus, the peoples of America have struggled to make sense of the capricious and violent nature of America's weather. Anasazi Indians used the rain dance (and sometimes human sacrifice) to induce rain, while the Puritans in New England blamed the sins of the community for lightening strikes and Nor'easters. IN modern times we carry on those traditions by blaming the weatherman for ruined weekends. Despite hi-tech satellites and powerful computers and 24-hour-a-day forecasting from The Weather Channel, we're still at the mercy of the whims of Mother Nature. Laskin recounts the many dramatic moments in American weather history, from the "Little Ice Age" to Ben Franklin's invention of the lightning rod to the Great Blizzard of the 1930's to the worries about global warming. Packed with fresh insights and wonderful lore and trivia, Braving the Elements is unique and essential reading for anyone who's ever asked, "What's it like outside?" David Laskin is the author of The Children’s Blizzard, which won the Washington State Book Award and Midwest Booksellers’ Choice Award for nonfiction. The author of several other works of nonfiction, Laskin writes for the New York Times and the Washington Post. He and his wife, the parents of three grown daughters, live in Seattle.